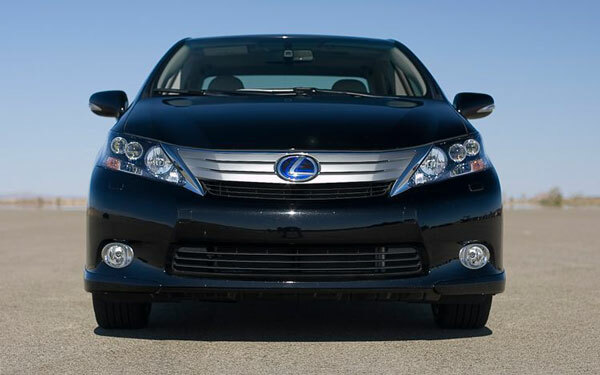 Hybrid drive systems can be designed to boost mileage as in the Prius or enhance performance as in the LS 460. The Lexus systems are a modular technology and can deliver any mix of the two. The new HS 250h falls somewhere in the middle of the hybrid spectrum. The result is a clean, efficient luxury car with good numbers both in power and fuel economy. The HS 250h gets an EPA-estimated 35 mpg in combined city and highway driving yet can accelerate from 0-60 mph in a respectable 8.4 seconds. In combination with the hybrid drive motor, the HS 250h generates 187 total system horsepower, running on regular unleaded gasoline. more than a compulsion to drive harder and faster. features consistent with a car in this price range. Touch system, eliminates the need for touch screen controls. The 2010 HS 250h ($34,200) comes in standard and Premium ($36,970) models. wheels, sport suspension and pedals, and leather interior trim. ($300), and 18-inch alloy wheels ($770). and headlamp washers ($1805), and a rear spoiler ($200). Safety features include a 10-airbag supplemental restraint system and front active head rests. What is the point of taking this car out? what would you replace your LS430 with?